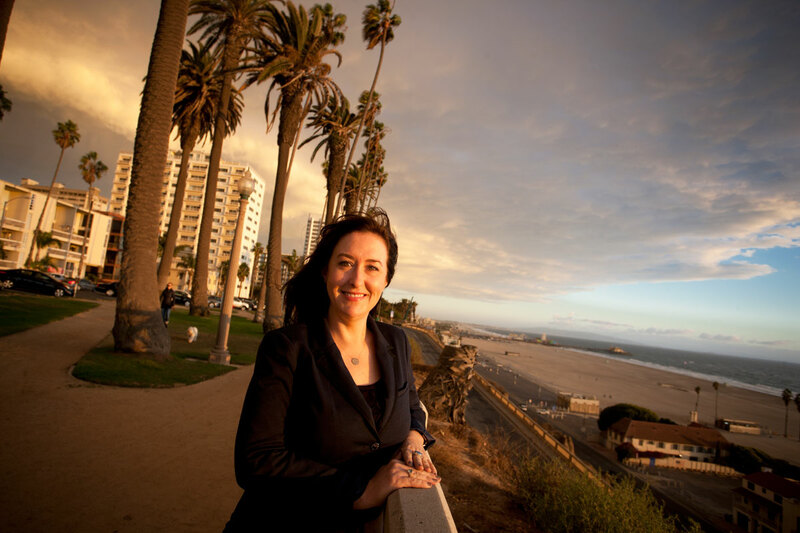 We started our Southwest tour in the Los Angeles area where we met Lana Rushing (’94 journalism/mass communication), principal and owner of Rushing Public Relations, at a coffee shop in Santa Monica. We also learned just how windy it can be on the Southern California coast and what havoc that can create during a photo shoot. The next day we traveled to Temecula to meet with Rosie (Iverson) Wilson, owner (along with her husband, Gerry) of Wilson Creek Winery & Vineyards. Rosie is a 1952 child development grad, and she and Gerry showed us a terrific time at the winery and restaurant they run with the help of their family. 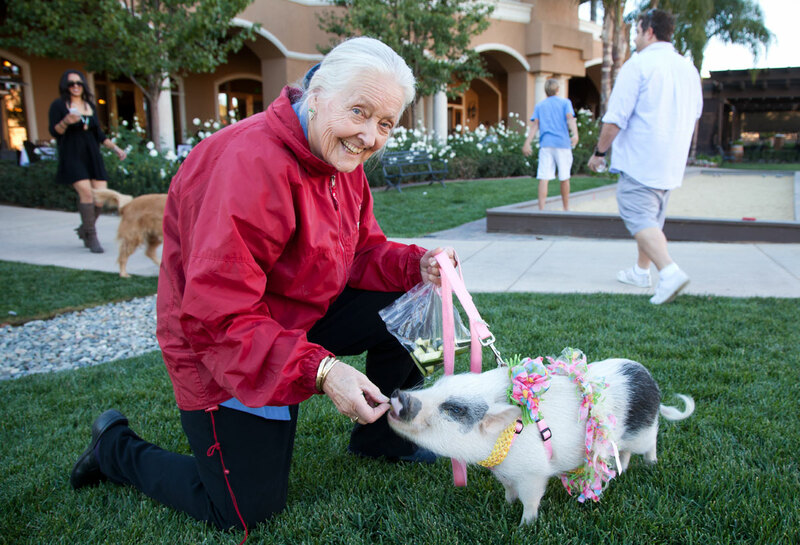 We even got to meet their pet pig, Molly Merlot, who was dressed in flowers and more adorable than I knew a pig could be. Up next was a trip to Las Vegas to meet Alison Monaghan, a 2005 journalism/mass communication grad. Alison is a senior account executive for Kirvin Doak Communications. We met her on the Las Vegas Strip, which is not the easiest place to do a photo shoot. 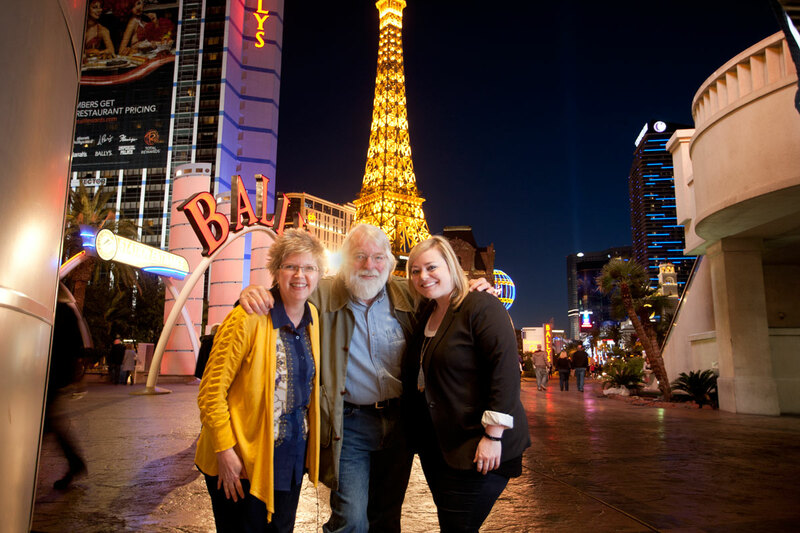 That’s me, Jim, and Alison standing near the Paris Las Vegas. 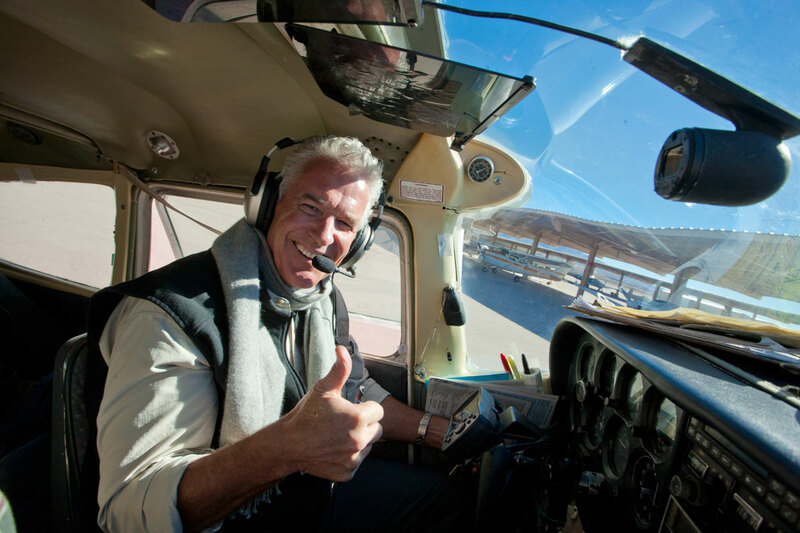 The following morning we met Bob Gannon (’74 ag business) at the Henderson Executive Airport. I’ve wanted to do a story on Bob for years, so it was really exciting to interview and photograph him. Bob’s been around the world 2.5 times in a single-engine airplane, and he took Jim and me on a most memorable ride. After leaving Bob in Henderson, Nev., we drove to Flagstaff, Ariz., for the night. I knew it would be cold during some of this trip, and I thought I was prepared, but I was still surprised that the temperature gauge read 14 degrees the next morning! We did not have an ice scraper in our rental car, so we had to blast the defrost for awhile before taking off for Sedona to meet with Elizabeth “Debbie” (Sisson) Wych. 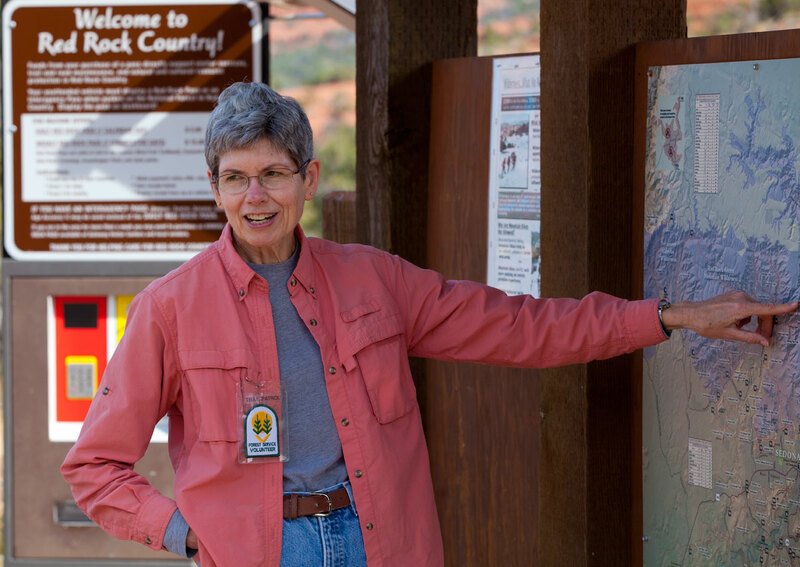 Debbie (’70 elementary education) is a retired elementary school counselor who hikes and volunteers extensively in beautiful Sedona. From there we drove to Tucson. The next morning we met U.S. Border Patrol public affairs officer Jeremy Copeland, who drove us about an hour and a half to Sells, Ariz., to meet up with ISU alumnus Shawn Kyne (’05 political science). Shawn has been a U.S. Border Patrol agent since 2008. The two of them took Jim and me on a wild ride-along through the Tohono O’odham Indian Reservation, which is roughly the size of Connecticut. 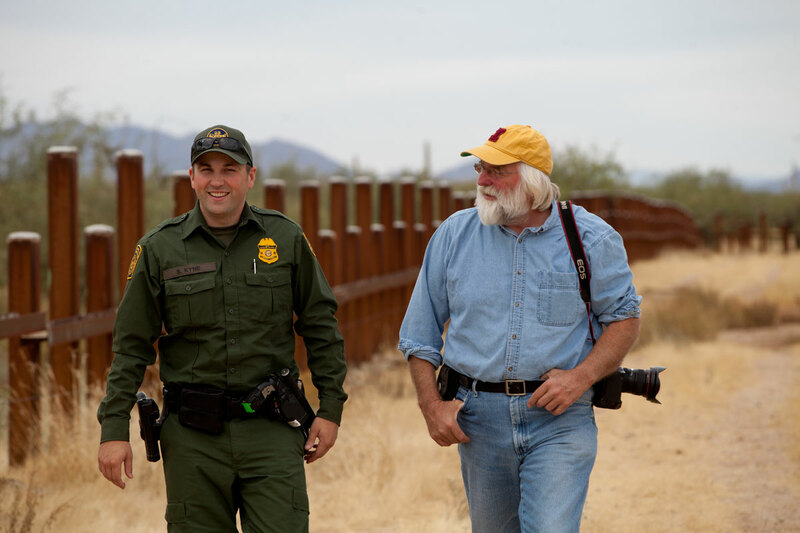 That’s Jim and Shawn at the U.S./Mexico border fence. The next day, all we did was drive: from Tucson across southeast Arizona all the way up to north-central New Mexico. It was a long day, broken up by lunch in the tiny town of Hatch, N.M., AKA The Chile Capital of the World. We sampled the famous red and green chiles and found them both delicious. We ended our drive in Santa Fe. 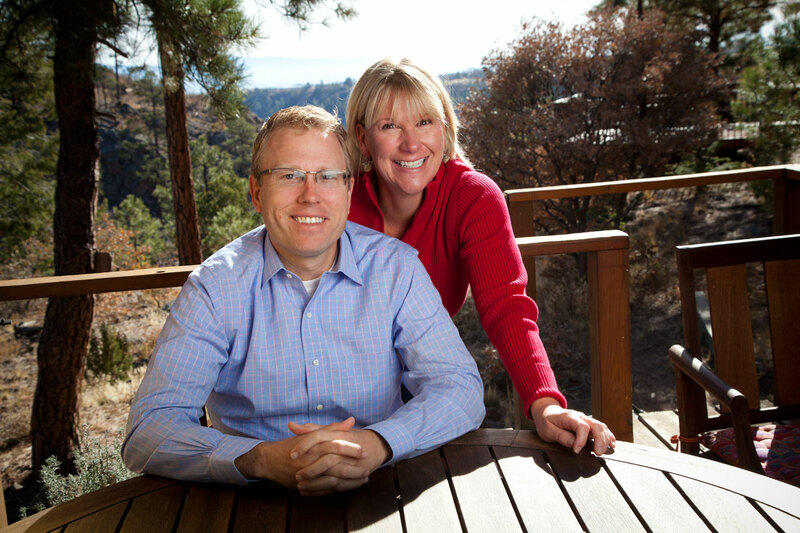 We drove the next morning up the mountains into Los Alamos, where we met Kory Budlong Sylvester (’92 nuclear engineering). 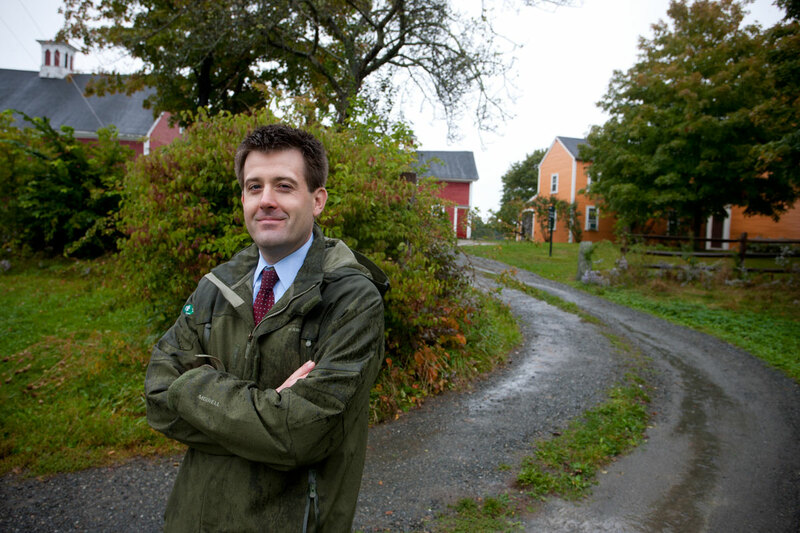 Kory is a technical staff member of the Nonproliferation and International Security Division for the Los Alamos National Laboratory. 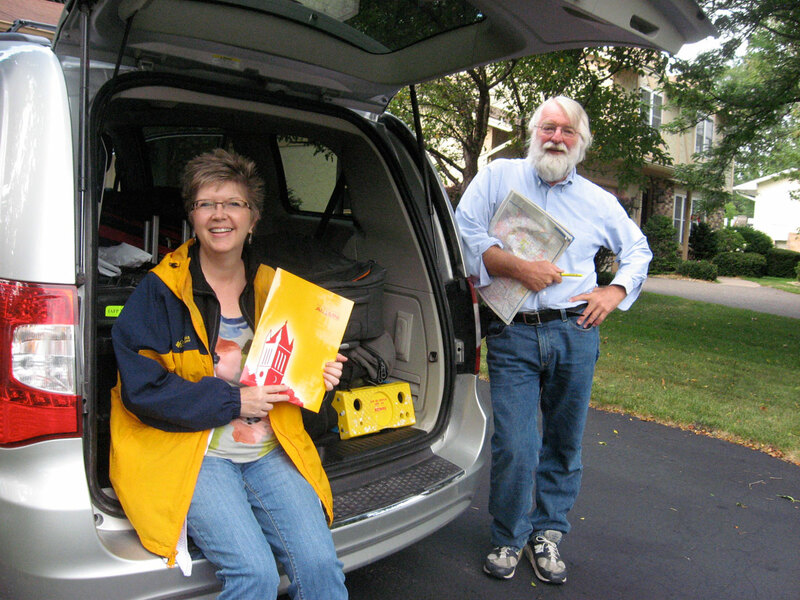 He and his wife, Susan (’86 journalism/mass communication), above, have two sons and long, loyal ties to Iowa State. From there, we went back through Santa Fe (for dessert and a quick peek through a few art galleries) and on to our final destination: Albuquerque. Jim and I fell in love with Albuquerque, which was a good thing because we had to kill a full day there. 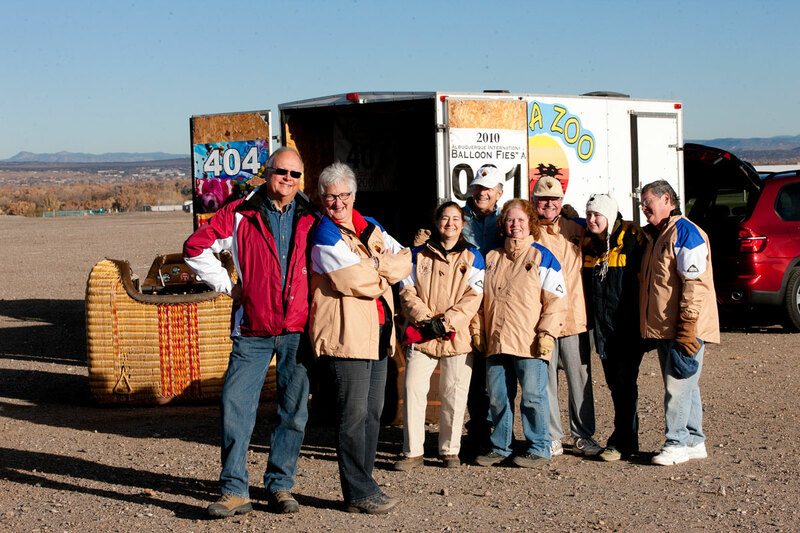 We were scheduled to meet with hot-air balloonists Lyndi Dittmer-Perry (’83 industrial administration) and her husband, Jim Perry (’67 electrical engineering), before dawn near the Balloon Fiesta Park, but the weather didn’t cooperate, nor did it cooperate later that day. So we moved our photo shoot to the following morning, which was also the day we were scheduled to travel back to Iowa. Luckily, everything worked out, and Jim and I had a blast with Jim and Lyndi and their “It’s a Zoo” balloon crew (above, with Jim and Lyndi at the far left). It was the perfect way to end a great trip. As always, some of these alumni features will be published in the special spring 2014 VISIONS Across America issue and others will appear in the coming weeks on this blog. Thanks for reading! I will admit we have become lost dozens of times, even with redundant systems of navigation (Mapquest, GPS, and regular old maps on my lap at all times), although considering that I am the Chief Navigator I guess I should take at least partial responsibility for this. We have also been lucky that of our 18 flights, not one has been cancelled, late, or even slightly turbulent. That’s something to be thankful for. Happy Thanksgiving, everyone! Jim and I are a long way from home. This week we’ve traveled to California, Nevada, and Arizona. Yesterday we spent the day doing a ride-along with Shawn Kyne (2005 political science), a U.S. Border Patrol agent for the Tucson Sector. 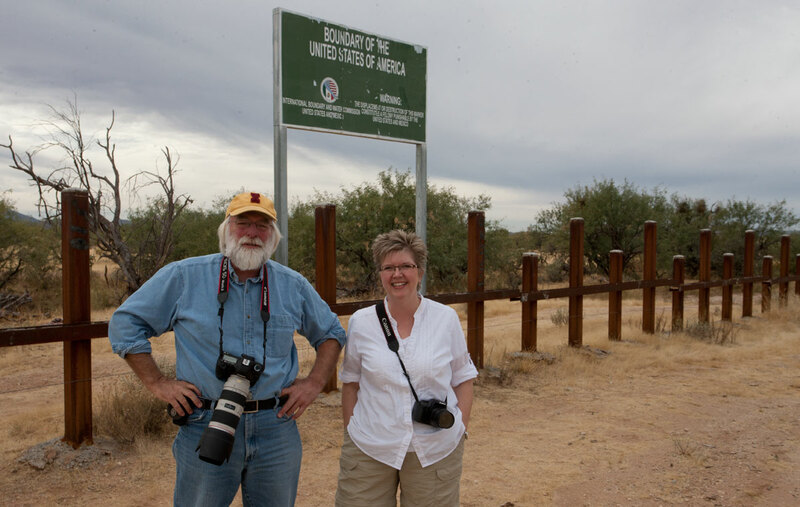 This photo shows Jim and me at the U.S.-Mexico border south of Sells, Ariz., in the Tohono O’odham Nation. It was a fascinating experience. Now we’re in New Mexico for a couple of days before coming back to Iowa just in time for Thanksgiving.